With the world rapidly approaching Armageddon, it is very important to properly select your gun.‚ When you are choosing what gun to buy, you need to decide what your needs are.‚ Simple home defense? Concealed weapons? Target shooting?‚ Long range sniping?‚ Anti-armor guns?‚ Anti- aircraft needs?‚ Population decimation?‚ Whatever your needs, I will advise you in what guns you should buy. Best Sniper Rifle – Let’s just say, hypothetically of course, that you are pretty angry at some high-ranking officials in the United States government.‚ Maybe you don’t like the idea of being a serf under Dictator Henry Paulson.‚ Or you want to pull a John Wilkes Booth on President George Bush because he increased the national debt more than any other president in history.‚ In either of those hypothetical cases you are going to prison for a very long time and there is nothing I can do to help you.‚ As a matter of fact, I think I am going to go to prison for even making that joke.‚ However, if you are a sane person and would like a powerful sniper rifle with a maximum effective range of 1,000 yards (you can kill things at further than a half mile away! 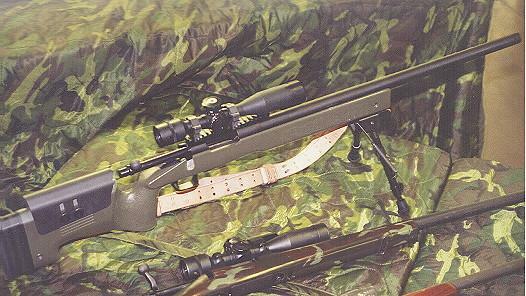 ), you should be using the M403A designed specifically for US Marine Corps snipers in 1996.‚ This sniper rifle is the best in the world at this point in time and will love you more than your own mother. Best Standard Machine Gun – Want to cut a man in half, then cut his truck in half, then cut his house in half?‚ The newest version of the M60 can fire 850 rounds with one trigger pull. Watch the video of the demonstration below. Best Machine Gun Period – The machine gun in the following video will put a hurting on you in ways you never dreamed of before. The gun is capable of firing one million rounds per minute (where you will store your million rounds beats me). It just sounds like one gun blast. What a monster. Best Laser – Boeing recently launched its new Advanced Tactical Laser mounted on a Hercules transport aircraft. The laser is supposed to be supernaturally accurate, capable of destroying the tires and guns on vehicles without harming the soldiers in them. A description of the Advanced Tactical Laser by a request to deploy it to Iraq says, “Precision engagement of a PID [Positively Identified] insurgent by a DEW [Directed Energy Weapon] will be a highly surgical and impressively violent event. Target effects will include instantaneous burst-combustion of insurgent clothing, a rapid death through violent trauma, and more probably a morbid combination of both. It is estimated that the aftermath of a sub-second engagement by PASDEW [Precision Airborne Standoff Directed Energy Weapon] will also be an observable event leaving an impression of terrifyingly precise CF [Coalition Force] attribution in the minds of all witnesses.”‚ Geez… scary.‚ The laser itself is invisible and silent. Best Newfangled Gun- The well-named Cornershot is able to shoot around corners… perfect for those times when you don’t want to get killed.‚ The Cornershot is capable of swiveling through a one hundred and twenty degree range, just enough so retards like you don’t get it all the way around to blow your own head off.‚ The sights on the gun are hooked up to an LCD screen so the gunner can take aim without putting himself at risk. Best Advanced Rifle- The Metal Storm rifle is officially designated as the weapon of choice for zombie killers.‚ The Metal Storm is different than a regular gun in that it has no moving mechanical parts.‚ The only things that moves in the Metal Storm gun is projectiles, which are stacked together in each barrel.‚ The bullets in the Metal Storm can fire each round independently with an computerized electronic firing system.‚ The gun can literally fire another bullet before the first has even left the barrel. The gun can fire one projectile or dozens in basically the same second, essentially creating a laser-like path of destruction.‚ This gun will be mostly used to shoot down incoming missiles, but I found the rifle version to be extremely intriguing. Best Gun- The Navy is currently working on developing a railgun.‚ The difference between a railgun and other weapons is that the railgun is fired by storing a monstrous amount of electricity and then using that electricity that is sent through parallel rails creating a magnetic field that hurls a seven pound shell at more than five times the speed of sound.‚ The finished product will be capable of hitting a 5 meter target from more than 200 nautical miles away with the force of a Tomahawk missile.‚ Don’t mess around with the Navy or they could fire one of these vicious little babies at your house. Best Gun to Steal from Government- The XM 307 Airbursting 25 mm autocannon is the best gun that can be operated by just a couple of soldiers.‚ A fully operational version has already been built, but it is not yet in production.‚ The XM307 Airbursting Weapon System is capable of firing 25 mm armor piercing bullets or high explosive airbursting rounds at 260 shots per minute.‚ The XM307 is a gas-operated machine gun with a full solution electronic fire control to help you hit whatever you want at up to 2,000 meters (over a mile).‚ This baby needs to be operated by two people, so bring your buddy. I hope my guide on what are the best guns to buy helped you determine your plans for self-defense :). Previous Previous post: Best Handicapped License Plate- Timmmay!! !